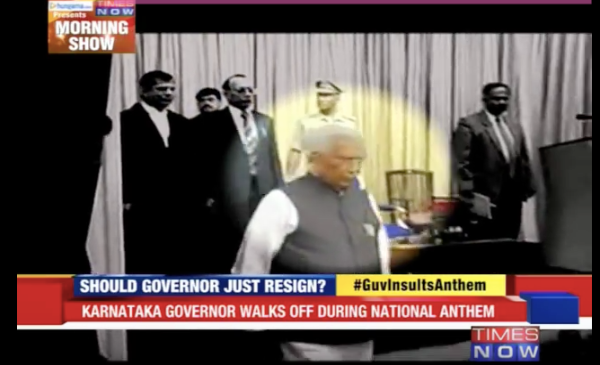 An old video of Karnataka Governor Vajubhai Vala disrespecting the National Anthem by walking away while the song was being played has been revived again on social media. The video that first went viral three years back in March 2015 is now being shared by those upset with his decision to allow BJP to form the government despite not having the required numbers in their kitty. The video has also gone viral on Twitter with some projecting it to be a recent one, referring to his RSS roots and accusing him of insulting the national anthem. FACT: The faux pas by the Karnataka Governor took place on March 10, 2015 when he walked off the stage even as the national anthem was being played at the swearing-in of a Karnataka High Court judge at Raj Bhavan, reported The Times of India. In the video, the Governor after felicitating the judge got off the stage even as others stood in silence as the national anthem could be heard in the background. The governor’s guards taken aback by his sudden move could be seen running after him. According to the TOI report, Vala later said it was unintentional and he stopped as soon as he realized the Anthem was playing. News channel Times Now’s report of March 11, 2015 shows an embarrassed Vala returning to the stage till the anthem came to an end.